The challenge this month is to bring to light a drink that you think deserves to be resurrected from the past, and placed back into the spotlight. It could be pre-prohibition, post-war, that horrible decade known as the 80′s, it doesn’t really matter. As long as it is somewhat obscure, post it up. If possible try to keep to ingredients that are somewhat readily available. While we all appreciate the discovery of an amazing cocktail, if we can’t make it, it’s no fun for anyone. 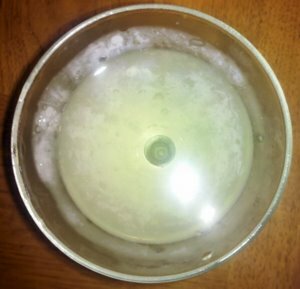 While I have spent a lot of time persuing older cocktail guides, I knew the drink I wanted to include when I read the topic: the Alaska Cocktail. And given today my region is in the throes of a snowpocalypse, I felt inspired to make one. I can’t remember when I first discovered the Alaska Cocktail. I know I’d made at least two at home before the time I went to Zig Zag, asked Murray for something with gin in, and he returned saying, “This is called the Alaska…” and I had to laugh, because I knew what was in it, and that I would love it. Stir with ice until glacially cold, strain into chilled cocktail glass. I have yet to find a good explanation for the name. The cocktail dates to at least the Savoy cocktail book, and probably before that. The Savoy recipe omits the bitters, and has a 3:1 ratio of chartreuse to gin. As written, it’s a fine drink, but I find going 4:1 makes a less sweet and more enjoyable drink, and adding orange bitters creates a nice balancing note. On occasion I will also use a lemon twist as a garnish, but really, with the chartreuse, the drink doesn’t need it. This is a potent drink, as yellow chartreuse is 80 proof. Occasionally, I will substitute green chartreuse, which is OK, but as with the Widow’s Kiss, yellow provides a much more balanced and drinkable product. Thanks to Dennis at Rock & Rye for a fun topic. Be sure to keep an eye out for the round-up! I came across this while trying to hunt down the creator of the Alaska. Your recipe is similar to Robert Hess’s in The Essential Bartender’s Guide, but you go crazy with a second dash of bitters. I might note that this recipe is 8:1, not 4:1. The Savoy version is much, much much sweeter. When I made it, I had to add lemon to balance it for my taste, but then it’s a different drink. You’re absolutely right about the ratios. Now I’m going to have to make a couple and see whether I really meant 1/4 ounce instead of 1/2, or if I really prefer it at 1:8 chartreuse to gin. It’s been long enough that I don’t remember. Oh, the things I endure for this blog!